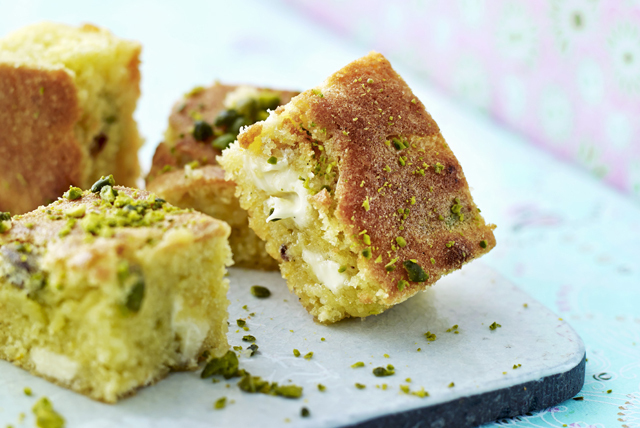 A surefire crowd pleaser, this moist cake is flavoured with chopped white chocolate and pistachios, then topped with an irresistible cinnamon-honey drizzle - the perfect dessert recipe. Line 8-inch square pan with parchment; spray with cooking spray. Beat cream cheese and 1/2 cup butter in large bowl with mixer until blended. Add sugar; beat until light and fluffy. Blend in 1 tsp. cinnamon and vanilla. Add eggs, 1 at a time, beating well after each addition. Gradually beat in flour until blended; stir in chocolate and 1/4 cup nuts. Pour into prepared pan. Bake 35 min. or until toothpick inserted in centre comes out clean. Meanwhile, microwave remaining butter, cinnamon and honey in microwaveable bowl on HIGH 1 min. or until butter is melted and mixture is well blended, stirring after 30 sec. Use skewer or fork to poke holes, in 1-inch intervals, in top of hot cake, being careful to not poke holes all the way through cake. Brush butter mixture over cake; sprinkle with remaining nuts. Cool cake in pan 30 min. Transfer cake from prepared pan to wire rack; cool completely. Substitute walnuts for the pistachios.